The Delaney WMA includes three flood control dams and is managed by the Massachusetts Division of Fisheries and Wildlife. 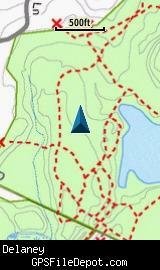 The trail maps for this area are divided into two sections: North and South. Click here for my KMZ of the northern section. 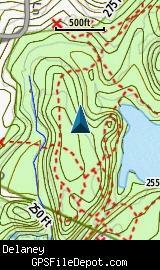 This KMZ map is set to Draw Order 40 so it will show 'beneath' the primary map on your Garmin KMZ-compatible GPS but above my KMZ map of the northern section of Delaney WMA (for proper 'layering' on your GPSr).